There is so much more to our Frostburg than the amazing retail and restaurant establishments we go to every day. There is infrastructure and businesses we only consult a few times a year but nevertheless are integral to Main Street, like Edward Jones. According to Frostburg Financial Advisor Douglas Kramer, Edward Jones primarily “partners with people to develop their financial plan guiding them into and through the retirement years” and have done so for many years. Edward Jones was founded in 1922; originally called Edward D. Jones & Co., L.P., the name was shortened to simply Edward Jones in 1995. The firm, based out of Missouri, boasts nearly 14,000 branch locations and serves 7 million clients. Focusing mainly on individuals and small business owners, the firm offers commission based and fee-based financial products. The business model keeps the branches small. Each branch has only one financial advisor and a small number of office administrators. This allows branches to flourish in small towns and build close working relationships with clients. The Frostburg branch, located at 139 East Main Street, has three full-time employees; Douglas Kramer – Financial Advisor, Cindy Widmar – Branch Office Administrator, and Linda Snyder – Senior Branch Office Administrator. Kramer has been with the firm since 1992 when the Frostburg branch originally opened on Broadway. The branch moved to Main Street in 1999 and they hope to open another branch in Frostburg over the next 5 years. Kramer makes sure the firm stays involved in the local community. 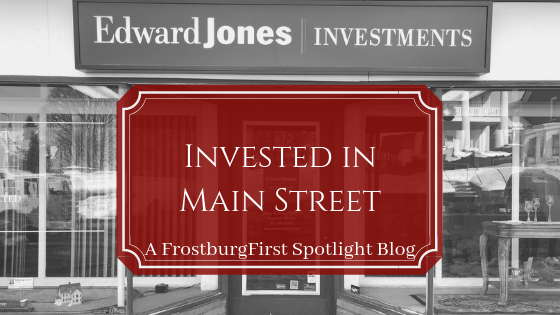 “It’s my community,” he states, “and I want to be a part of it and help it build.” Edward Jones works regularly with the Foundation for Frostburg and has been a supportive Main Street business for many years. When asked what he loves about Frostburg, Kramer exclaimed, “The volunteer fire department!” He elaborated stating, “the city of Frostburg does a really nice job with the resources they have, taking care of the community, roads, parks, people, etc.” People really pull together here and give of themselves in a way that larger cities can’t touch. For all your financial needs contact Douglas Kramer at doug.kramer@edwardjones.com or stop by Edward Jones at 139 East Main Street in Frostburg.